Aw, this is our last check-in before we're done! I'm pretty excited to finish it up to be honest! 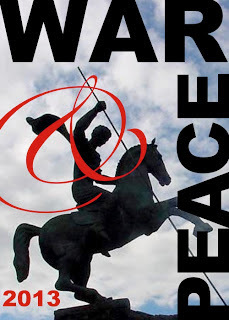 Just a reminder, whether you finished, finished a long time ago, or didn't finish at all, we're having a War & Peace carnival at the end of the year to celebrate our journeys through the book this year. Also, since it's all Russia themed, it's a good time to get your mind ready for the 2014 Winter Olympics! Haha anyway, I haven't read the epilogue yet, but I did manage to read this section, although, confession: I totally skimmed through a lot of the war stuff. I just didn't really care plus I knew Tolstoy was lecturing us about The Truth of what happened. Poor Peter Rostov :( I was amused by him which meant to me that for sure he was going to die, which he did. I think he represented the idea of the young clueless men caught up in the glory of war quite well. Aw oh well. I also really liked how Tolstoy described the grief of Marya and Natasha, aw. And it's going to be Pierre and Natasha after all. Let us glory in the fact that a REAL WOMAN exists to help a man feel listened to and understood and good about himself. RME. Why do you write these things Tolstoy? But aw despite myself I liked how he described the closeness of Natasha and Marya even if he said it was the kind of closeness only women can have. Perhaps from his perspective that's true, but surely close friendships between men have been recorded even earlier than War & Peace! I don't have much else to say about this section...but I do want to know what you think!! If there was no epilogue, how do you feel about this ending? Were you surprised by Peter's death? (after you remembered who he was) Do you like the final couples? Do you think you learned about this war? Has Tolstoy made you smarter and wiser? Tell me everything! And please join in our carnival at the end of the year!